Bobcat unveiled its new 74-hp T595 compact track loader. With a 2,200-pound rated operating capacity and improved lift force, the T595 compact track loader from Bobcat Company can help increase job site productivity, the company said. 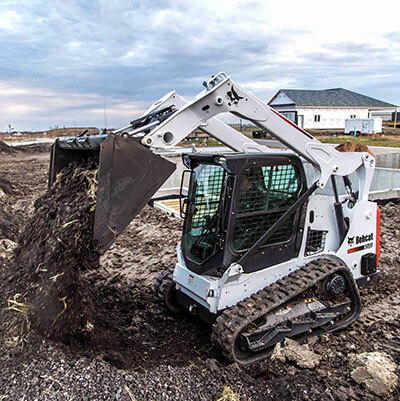 At 68 inches wide with a standard construction/industrial bucket, the loader’s compact size allows it to work in confined spaces, Bobcat said. Its rubber tracks minimize ground disturbance. Operators can choose from more than 50 Bobcat attachments approved for use with the T595. Non-hydraulic attachments can be changed easily from inside the cab with the press of a button, activating the Power Bob-Tach attachment mounting system. Bobcat T595 compact track loaders come with standard controls (hands and feet). The advanced control system and selectable joystick controls are available as options. Available on the new T595 is a two-speed travel option. It allows operators to choose between low and high travel speeds. The machine’s max travel speed is 10.4 mph. The T595 is powered by a 74-hp, EPA Tier 4-compliant turbo diesel engine, which does not require a diesel particulate filter or diesel exhaust fluid. Lift height to hinge pin is 119 inches and features an operating weight of 8,055 pounds. Additional design elements include a guard bar placed in front of the coupler for protection, a solid steel tailgate and a machine shutdown protection system to monitor engine coolant temperature, engine oil pressure and engine rpm.